Since 1996, Clean Air Services has been serving the needs of Alberta’s residents and businesses. As a leader in the industry, we are committed to providing safe and cost-effective hazardous material abatement. Any abatement project’s success is completely dependent on the quality of the abatement contractor. Choosing an experienced crew is paramount to maximize productivity and efficiency while maintaining on-site safety. Our safety manager is always reviewing our procedures and safety policies to ensure we’re meeting the latest industry standards. At Clean Air Services, we have a commitment to a diligent work ethic with a direct focus on health and safety standards. We have experienced project managers and highly trained personnel at work on every abatement task we undertake and we use environmental consultants to monitor air quality and document our site-specific procedures and daily activities. When you choose Clean Air Services, you can rest assured that you’re dealing with consummate professionals! The management and personnel at Clean Air Services are committed to working safely to help achieve the public’s security and to protect the environment. We are proud members of the COR safety program and our team’s safety manager is always reviewing our procedures to be certain that we adhere to the latest industry standards. A copy of our safety manual is available upon request. Clean Air Services carries $5,000,000 general liability insurance written for asbestos abatement work. A copy of this insurance policy is available upon request. We are registered with WCB Alberta No. 372134/2and Saskatchewan No. A164442. Andrew says trust plays a big role in Clean Air’s relationship with its clients. Whether you’re renovating a home or business, or picking up the pieces after a flood, when it comes to cleaning up dangerous hazardous materials such as mould and asbestos you need professionals who will do the job right the first time. For nearly 20 years, Clean Air Services Inc. a family-run business, has safely removed asbestos and mould from industrial and commercial buildings and homes in Calgary, Lethbridge and throughout Alberta. 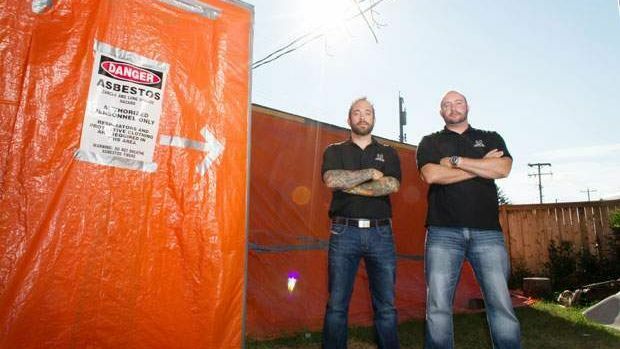 Owners Andrew and Graham Crook say their company follows the latest, strictest provincial guidelines when it comes to removing mould, which can grow within days of a flood, and asbestos, a cancer-causing agent that was once a common material used in construction. Clean Air’s 70-strong team, based in Calgary and Lethbridge, will come out to a property where asbestos or mould has been discovered and use the latest equipment — such as air scrubbers and industrial-strength HEPA vacuums — to remediate the problem as quickly and safely as possible.